Born the Son of a London woollen draper, he was a famous botanist, an avid gardener and at the forefront of the exchange of mid-18th Century scientific ideas. This web site has been prepared as a tribute to the work and life of Peter Collinson FRS by the Mill Hill Preservation Society. Mill Hill, in North London, is where he spent much of his life and where he had one of his most prestigious gardens. It is not meant to be a perfect, nor complete, tribute to his life and work but is an attempt to fill some of the gaps about this genius of a man. 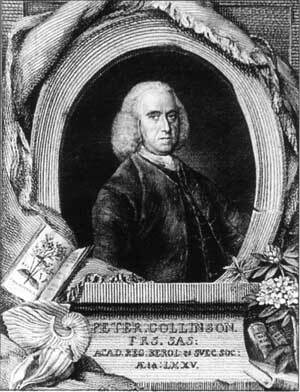 The site has been launched to commemorate the 250th anniversary of the death of Peter Collinson in 2018. The authors, Trevor Chilton and John Living, both members of the Mill Hill Preservation Society would welcome any comments, articles and additions by email to the Society.